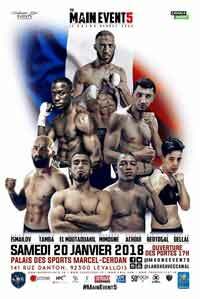 Review by AllTheBestFights.com: 2018-01-20, fight not particularly exciting between Franck Petitjean and Andrea Scarpa: it gets two stars. Franck Petitjean entered this fight with a boxing record of 19-4-3 (3 knockouts) and he is ranked as the No.49 super lightweight in the world. He lost to Rafik Harutjunjan in 2014 but since then he has collected eight victories and one draw beating Samuele Esposito and Felix Matamoros in 2017. His opponent, Andrea Scarpa, has an official record of 22-3-0 (10 knockouts) and he entered as the No.55 in the same weight class. He lost to Ohara Davies in 2016 (=Scarpa vs Davies) but he came back to win in 2017 with Juan Ocura and Giorgi Abramishvili. Petitjean vs Scarpa is valid for the EBU-EU (European Union) super lightweight title; undercard of Maiva Hamadouche vs Myriam Dellal. Watch the video and rate this fight!